When going to a trade show (35 years +), the goal for me, is to leave with new ideas – plants, tools, solutions. Last week at the FNGLA “Landscape Show” in Orlando, the goal remained the same. The show like most Trade Shows included booths full of great looking plants and products. The landscape industry like so many industries in these economic times, faces difficult times. Landscaping is tied to the hammered building/housing market, which continues to struggle. Specifically large trees – field grown and container, experience sluggish sales. This means, lots of big plant material (oversized) can be found to jump-start and create terrific landscape installations at reasonable prices. Overall, at a show I look for anything unique, unusual or new which could “make a difference” in the landscape, lawn or indoors. The sound of water and its use in the landscape always introduces a “tranquil” feel. I’ve visited many landscape projects where the homeowner incorporated water features into their landscaping plan. When done right, the simple sound of water dropping into a pool of water creates a peaceful setting. When lighting is added to water features a whole new dimension comes alive. Add colors with the light and another layer gets added. At one booth, I learned about – Fiber optic pool lighting – and found it fascinating. Learn more fiber optic pool lighting (includes video). 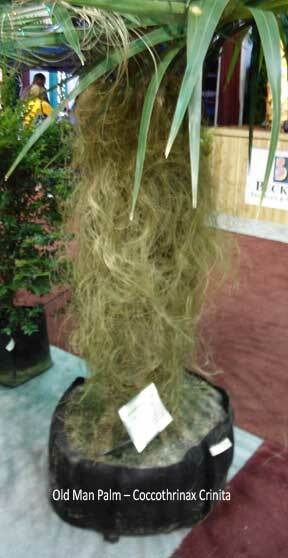 One vendor also very interesting, developed new grasses. Spending some time talking with the personnel helped me understand much more about the world of turf… and I’ll be sharing more with you. When buying landscape plants and house plants, it is always best to ask for a “named variety.” For example, Bromeliads, some varieties are known to hold their color the longest. So asking for a named variety like Guzmania “Luna” rather than ask for simply a – Bromeliad, will get you more what you want. However, when looking at grass for our lawn we stay more in the general mode. We ask for – St Augustine, Zoysia or Bermuda when in fact we can go deeper and specify a variety. As an example, this company developed three varieties of St. Augustine grass – Palmetto, Sapphire and Captivia. All different to meet specific needs. 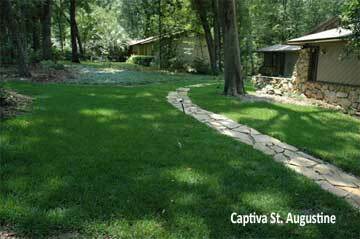 We’ll be doing some grass follow up and expanding the popular topic of lawn and grasses. Water, quality, quantity in lawn and landscape uses continues to draw attention. We all should want to get the most out of our irrigation and watering practices. We’ve given tips to improve your irrigation. As someone who has filled a few million pots by hand with a shovel, I know how the back can feel after repetitively picking up shovel fulls of soil. My only concern is when attached to the shovel how “easy” is it to snap the shovel handle. Finally, there was Pacific Home Garden which had a booth full of great looking pottery, planters, jars and fountains. Rustic, glazed, stone and a host of colors, shapes and sizes. Lots of potential using decorative pottery to dress up a patio or front entrance. Check out the Pacific Home Garden website. Last week we shared the upcoming curation and organizing of “Guides” to help visitors – Get Started – in a areas they hold interest. Basically, we are providing an overview of the topic and want to keep links down to 8-10 jumping off points. Would you please visit the following: House Plants 101 and let us know what needs to be added or removed. Please reply from your newsletter email or use the contact form here.